Angela Isadora Duncan (May 26, 1877 or May 27, 1878[a] – September 14, 1927) was an American and French dancer who performed to acclaim throughout Europe. Born in California, she lived in Western Europe and the Soviet Union from the age of 22 until her death at age 50, when her scarf became entangled in the wheels and axle of the car in which she was riding. 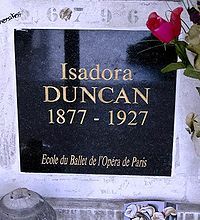 Isadora Duncan was born in San Francisco, the youngest of the four children of Joseph Charles Duncan (1819–1898), a banker, mining engineer and connoisseur of the arts, and Mary Isadora Gray (1849–1922). Her brothers were Augustin Duncan and Raymond Duncan; her sister, Elizabeth Duncan, was also a dancer. Soon after Isadora's birth, her father was exposed in illegal bank dealings, and the family became extremely poor. Her parents divorced when she was an infant, and her mother moved with her family to Oakland, California, where she worked as a seamstress and piano teacher. From ages six to ten, Isadora attended school, but she dropped out, finding it constricting. As her family was very poor, she and her three siblings earned money by teaching dance to local children. In 1896, Duncan became part of Augustin Daly's theater company in New York, but she soon became disillusioned with the form and craved a different environment with less of a hierarchy. Her father, along with his third wife and their daughter, died in 1898 when the British passenger steamer SS Mohegan ran aground off the coast of Cornwall. Abraham Walkowitz's Isadora Duncan #29, one of many works of art she inspired. Duncan began her dancing career at a very early age by giving lessons in her home to neighbourhood children, and this continued through her teenage years. Her novel approach to dance was evident in these early classes, in which she "followed [her] fantasy and improvised, teaching any pretty thing that came into [her] head". A desire to travel brought her to Chicago, where she auditioned for many theater companies, finally finding a place in Augustin Daly's company. This took her to New York City where her unique vision of dance clashed with the popular pantomimes of theater companies. In New York, Duncan took some classes with Marie Bonfanti but was quickly disappointed in ballet routine. Feeling unhappy and unappreciated in America, Duncan moved to London in 1898. She performed in the drawing rooms of the wealthy, taking inspiration from the Greek vases and bas-reliefs in the British Museum. The earnings from these engagements enabled her to rent a studio, allowing her to develop her work and create larger performances for the stage. From London, she traveled to Paris, where she was inspired by the Louvre and the Exposition Universelle of 1900. In 1902, Loie Fuller invited Duncan to tour with her. This took Duncan all over Europe as she created new works using her innovative technique, which emphasized natural movement in contrast to the rigidity of tradition ballet. She spent most of the rest of her life touring Europe and the Americas in this fashion. Despite mixed reaction from critics, Duncan became quite popular for her distinctive style and inspired many visual artists, such as Antoine Bourdelle, Auguste Rodin, Arnold Rönnebeck, and Abraham Walkowitz, to create works based on her. Duncan disliked the commercial aspects of public performance, such as touring and contracts, because she felt they distracted her from her real mission, namely the creation of beauty and the education of the young. To achieve her mission, she opened schools to teach young women her philosophy of dance. The first was established in 1904 in Berlin-Grunewald, Germany. This institution was the birthplace of the "Isadorables" (Anna, Maria-Theresa, Irma, Liesel, Gretel, and Erika), Duncan's protégées who would continue her legacy. Duncan legally adopted all six girls in 1919, and they took her last name. After about a decade in Berlin, Duncan established a school in Paris that was shortly closed because of the outbreak of World War I. In 1910, Duncan met the occultist Aleister Crowley at a party, an episode recounted by Crowley in his Confessions. He refers to Duncan as "Lavinia King", and would use the same invented name for her in his novel Moonchild. Crowley wrote of Duncan that she "has this gift of gesture in a very high degree. Let the reader study her dancing, if possible in private than in public, and learn the superb 'unconsciousness' — which is magical consciousness — with which she suits the action to the melody." Crowley was, in fact, more attracted to Duncan's bohemian companion Mary Dempsey (a.k.a. Mary D'Este or Desti), with whom he had an affair. Desti had come to Paris in 1901 where she soon met Duncan, and the two became inseparable. Desti also appeared in Moonchild, as "Lisa la Giuffria" She joined Crowley's occult order, helping him to write his magnum opus Magick (Book 4) under her magical name of "Soror Virakam"; she also co-edited four numbers of Crowley's journal The Equinox, and contributed several collaborative plays to the journal. Desti wrote a memoir of her experiences with Duncan that includes some autobiographical material. In 1911, the French fashion designer Paul Poiret rented a mansion — Pavillon du Butard in La Celle-Saint-Cloud — and threw lavish parties, including one of the more famous grandes fêtes, La fête de Bacchus on June 20, 1912, re-creating the Bacchanalia hosted by Louis XIV at Versailles. Isadora Duncan, wearing a Greek evening gown designed by Poiret, danced on tables among 300 guests; 900 bottles of champagne were consumed until the first light of day. Duncan, said to have posed for the photographer Eadweard Muybridge, placed an emphasis on "evolutionary" dance motion, insisting that each movement was born from the one that preceded it, that each movement gave rise to the next, and so on in organic succession. Her dancing defined the force of progress, change, abstraction and liberation. In France, as elsewhere, Duncan delighted her audience. In 1914, Duncan moved to the United States and transferred her school there. A townhouse on Gramercy Park was provided for its use, and its studio was nearby, on the northeast corner of 23rd Street and Fourth Avenue (now Park Avenue South). Otto Kahn, the head of Kuhn, Loeb & Co., gave Duncan use of the very modern Century Theatre at West 60th Street and Central Park West for her performances and productions, which included a staging of Oedipus Rex that involved almost all of Duncan's extended entourage and friends. During her time in New York, Duncan posed for a number of studies by the photographer Arnold Genthe. Duncan had been due to leave the United States in 1915 aboard the RMS Lusitania on its ill-fated voyage, but historians believe her financial situation at the time drove her to choose a more modest crossing. In 1921, Duncan's leftist sympathies took her to the Soviet Union, where she founded a school in Moscow. However, the Soviet government's failure to follow through on promises to support her work caused her to return to the West and leave the school to her protégée Irma. In 1924, Duncan composed a dance routine called Varshavianka to the tune of the Polish revolutionary song known in English as Whirlwinds of Danger. Duncan in a Greek-inspired pose and wearing her signature Greek tunic. She took inspiration from the classical Greek arts and combined them with an American athleticism to form a new philosophy of dance, in opposition to the rigidity of traditional ballet. Breaking with convention, Duncan imagined she had traced dance to its roots as a sacred art. She developed from this notion a style of free and natural movements inspired by the classical Greek arts, folk dances, social dances, nature and natural forces as well as an approach to the new American athleticism which included skipping, running, jumping, leaping and tossing. Duncan's philosophy of dance moved away from rigid ballet technique and towards what she perceived as natural movement. To restore dance to a high art form instead of merely entertainment, she strove to connect emotions and movement: "I spent long days and nights in the studio seeking that dance which might be the divine expression of the human spirit through the medium of the body's movement." She believed dance was meant to encircle all that life had to offer—joy and sadness. Duncan took inspiration from ancient Greece and combined it with an American love of freedom. Her movement was feminine and arose from the deepest feelings in her body. This is exemplified in her revolutionary costume of a white Greek tunic and bare feet. Inspired by Greek forms, her tunics also allowed a freedom of movement that corseted ballet costumes and pointe shoes did not. Costumes were not the only inspiration Duncan took from Greece: she was also inspired by ancient Greek art, and utilized some of its forms in her movement (see image). Duncan wrote of American dancing: "let them come forth with great strides, leaps and bounds, with lifted forehead and far-spread arms, to dance." Her focus on natural movement emphasized steps, such as skipping, outside of codified ballet technique. Duncan also cited the sea as an early inspiration for her movement. Also, she believed movement originated from the solar plexus, which she thought was the source of all movement. It is this philosophy and new dance technique that garnered Duncan the title of the creator of modern dance. In both professional and private life, Duncan flouted traditional mores and morality. She was bisexual and an atheist, and alluded to her communism during her last United States tour, in 1922–23: she waved a red scarf and bared her breast on stage in Boston, proclaiming, "This is red! So am I!" Duncan bore two children, both out of wedlock. The first, Deirdre Beatrice (born September 24, 1906), by theatre designer Gordon Craig, and the second, Patrick Augustus (born May 1, 1910), by Paris Singer, one of the many sons of sewing machine magnate Isaac Singer. Both children drowned in the care of their nanny in 1913 when their runaway car went into the Seine. Following the accident, Duncan spent several months recuperating in Corfu with her brother and sister. She then spent several weeks at the Viareggio seaside resort with the actress Eleonora Duse. The fact that Duse had just left a relationship with the rebellious and epicene young feminist Lina Poletti fueled speculation as to the nature of Duncan and Duse's relationship, but there has never been any indication that the two were involved romantically. In her autobiography, Duncan relates that she begged a young Italian stranger, the sculptor Romano Romanelli, to sleep with her because she was desperate for another baby. She became pregnant by him, and gave birth to a son on August 13, 1914; the infant died shortly after birth. In 1921, after the end of the Russian Revolution, Duncan moved to Moscow where she met the acclaimed poet Sergei Yesenin, who was 18 years her junior. On May 2, 1922, they married, and Yesenin accompanied her on a tour of Europe and the United States. However, the marriage was brief, and in May 1923 he left Duncan and returned to Moscow. Two years later, on December 28, 1925, Yesenin was found dead in his room in the Hotel Angleterre in St Petersburg in an apparent suicide. Duncan had a relationship with the poet and playwright Mercedes de Acosta, as documented in numerous revealing letters they wrote to each other. In one, Duncan wrote, "Mercedes, lead me with your little strong hands and I will follow you – to the top of a mountain. To the end of the world. Wherever you wish." By the late 1920s, Duncan's performing career had dwindled, and she became as notorious for her financial woes, scandalous love life and all-too-frequent public drunkenness as for her contributions to the arts. She spent her final years moving between Paris and the Mediterranean, running up debts at hotels. She spent short periods in apartments rented on her behalf by a decreasing number of friends and supporters, many of whom attempted to assist her in writing an autobiography. They hoped it might be successful enough to support her. In a reminiscent sketch, Zelda Fitzgerald wrote how she and F. Scott Fitzgerald, her husband, sat in a Paris cafe watching a somewhat drunk Duncan. He would speak of how memorable it was, but what Zelda recalled was that while all eyes were watching Duncan, Zelda was able to steal the salt and pepper shakers from the table. In his book Isadora, an Intimate Portrait, Sewell Stokes, who met Duncan in the last years of her life, describes her extravagant waywardness. Duncan's autobiography My Life was published in 1927. The Australian composer Percy Grainger called Isadora's autobiography a "life-enriching masterpiece." On the night of September 14, 1927, in Nice, France, Duncan was a passenger in an Amilcar CGSS automobile owned by Benoît Falchetto, a French-Italian mechanic. She wore a long, flowing, hand-painted silk scarf, created by the Russian-born artist Roman Chatov, a gift from her friend Mary Desti, the mother of American film director Preston Sturges. Desti, who saw Duncan off, had asked her to wear a cape in the open-air vehicle because of the cold weather, but she would only agree to wear the scarf. As they departed, she reportedly said to Desti and some companions, "Adieu, mes amis. Je vais à la gloire!" ("Farewell, my friends. I go to glory! "); but according to the American novelist Glenway Wescott, Desti later told him that Duncan's actual parting words were, "Je vais à l'amour" ("I am off to love"). Desti considered this embarrassing, as it suggested that she and Falchetto were going to her hotel for a tryst. Her silk scarf, draped around her neck, became entangled around the open-spoked wheels and rear axle, pulling her from the open car and breaking her neck. Desti said she called out to warn Duncan about the scarf almost immediately after the car left. Desti brought Duncan to the hospital, where she was pronounced dead. As The New York Times noted in its obituary, Duncan "met a tragic death at Nice on the Riviera." "According to dispatches from Nice, Duncan was hurled in an extraordinary manner from an open automobile in which she was riding and instantly killed by the force of her fall to the stone pavement." Other sources noted that she was almost decapitated by the sudden tightening of the scarf around her neck. The accident gave rise to Gertrude Stein's mordant remark that "affectations can be dangerous". At the time of her death, Duncan was a Soviet citizen. Her will was the first of a Soviet citizen's to be probated in the U.S.
Duncan was cremated, and her ashes were placed next to those of her children in the columbarium at Père Lachaise Cemetery in Paris. On the headstone of her grave is inscribed École du Ballet de l'Opéra de Paris ("Ballet School of the Opera of Paris"). Duncan is known as "The Mother of Dance". While her schools in Europe did not last long, Duncan's work had impact in the art and her style is still danced based upon the instruction of Maria-Theresa Duncan, Anna Duncan, and Irma Duncan, three of her six adopted daughters. The adoption process was never verified, but all six of Isadora's dancers did change their last name to Duncan. Through her sister, Elizabeth, Duncan's approach was adopted by Jarmila Jeřábková from Prague where her legacy persists. By 1913 she was already being celebrated. When the Théâtre des Champs-Élysées was built, Duncan's likeness was carved in its bas-relief over the entrance by sculptor Antoine Bourdelle and included in painted murals of the nine muses by Maurice Denis in the auditorium. In 1987, she was inducted into the National Museum of Dance and Hall of Fame. Anna, Lisa, Theresa and Irma, pupils of Isadora Duncan's first school, carried on the aesthetic and pedagogical principles of Isadora's work in New York and Paris. Choreographer and dancer Julia Levien was also instrumental in furthering Duncan's work through the formation of the Duncan Dance Guild in the 1950s and the establishment of the Duncan Centenary Company in 1977. Another means by which Duncan's dance techniques were carried forth was in the formation of the Isadora Duncan Heritage Society, by Mignon Garland, who had been taught dance by two of Duncan's key students. Garland was such a fan that she later lived in a building erected at the same site and address as Duncan, attached a commemorative plaque near the entrance, which is still there as of 2016[update]. 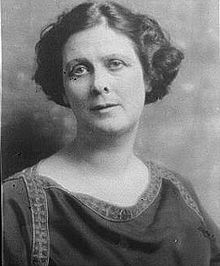 Garland also succeeded in having San Francisco rename an alley on the same block from Adelaide Place to Isadora Duncan Lane. In medicine, the Isadora Duncan Syndrome refers to injury or death consequent to entanglement of neckwear with a wheel or other machinery. Duncan has attracted literary and artistic attention from the 1920s to the present, in novels, film, ballet, theatre, music, and poetry. Duncan has been portrayed in novels including Aleister Crowley's Moonchild (as 'Lavinia King'), published in 1923, and Upton Sinclair's World's End (1940) and Between Two Worlds (1941), the first two novels in his Pulitzer Prize winning Lanny Budd series. She is also the subject of Amelia Gray's novel Isadora (2017). Two characters in the A Series of Unfortunate Events series of novels are named after her, Isadora Quagmire and Duncan Quagmire. The 1966 BBC biopic by Kenneth Russell, Isadora Duncan, the Biggest Dancer in the World, which was introduced by Duncan's biographer, Sewell Stokes, Duncan was played by Vivian Pickles. The 1968 film Isadora, nominated for the Palme d'Or at Cannes, stars Vanessa Redgrave as Duncan. The film was based in part of Duncan's autobiography. Redgrave was nominated for the Academy Award for Best Actress for her performance as Duncan. Archival footage of Duncan was used in the 1985 popular documentary That's Dancing!. A 1989 documentary, Isadora Duncan: Movement from the Soul, was nominated for the Grand Jury Prize at the 1989 Sundance Film Festival. In 1976 Frederick Ashton created a short ballet entitled Five Brahms Waltzes in the Manner of Isadora Duncan for Lynn Seymour of the Royal Ballet, in which "Ashton fused Duncan's style with an imprint of his own"; Marie Rambert claimed after seeing it that it was exactly as she remembered Duncan dancing. In 1981, she was the subject of a ballet, Isadora, written and choreographed by the Royal Ballet's Kenneth MacMillan, and performed at Covent Garden. A 1991 stage play When She Danced by Martin Sherman about Duncan's later years, won the Evening Standard Award for Vanessa Redgrave as Best Actress. In 2016, Lily-Rose Depp portrayed Duncan in The Dancer, a French biographical musical drama of dancer Loie Fuller. Celia Cruz recorded a track titled Isadora Duncan with the Fania All-Stars for the album Cross Over released in 1979. Rock musician Vic Chesnutt included a song about Duncan on his debut album Little. In the poem Fever 103 by Sylvia Plath, the speaker alludes to Isadora's scarves. ^ a b c While Duncan's birth date is widely given as May 27, 1878, her posthumously discovered baptismal certificate records May 26, 1877. Any corroborating documents that might have existed were likely destroyed in the 1906 San Francisco earthquake. See Stokes, Sewell. "Isadora Duncan". Encyclopædia Britannica. Retrieved 28 May 2015. ^ a b Craine, Debra; Mackrell, Judith (2000). The Oxford Dictionary of Dance (First ed.). Oxford [England]: Oxford University Press. p. 152. ISBN 9780198601067. OCLC 45663394. ^ a b c Deborah Jowitt (1989). Time and the Dancing Image. University of California Press. p. 75. ISBN 978-0-520-06627-4. ^ Genthe, Arnold (photographer). "Elizabeth Duncan dancer". Library of Congress. Retrieved 2017-10-07. ^ Lilian Karina; Marion Kant (January 2004). Hitler's Dancers: German Modern Dance and the Third Reich. Berghahn Books. p. 11. ISBN 978-1-57181-688-7. ^ Ean Wood, Headlong Through Life: The Story of Isadora Duncan (2006), p. 27: "They...would all be drowned, along with 104 others, when the S.S. Mohegan, en route from London to New York, ran aground on the Manacle Rocks off Falmouth, in Cornwall." ^ O'Connor, B. (1994). Barefoot Dancer: The Story of Isadora Duncan. Carolrhoda Books. p. 10. ISBN 978-0-87614-807-5. Retrieved 2016-09-17. ^ "Isadora Duncan | Biography, Dances, Technique, & Facts". Encyclopedia Britannica. Retrieved 2017-12-22. ^ Kassing, G. (2007). History of Dance: An Interactive Arts Approach. Human Kinetics. p. 185. ISBN 978-0-7360-6035-6. ^ "Isadora Duncan, 1877-1927: The Mother of Modern Dance". VOA. Retrieved 2018-02-16. ^ Abridged ed, p. 676. ^ The Untold Story: The Life of Isadora Duncan 1921–1927 (1929). ^ "April 9 - 1930. Pioneer Photographer Of Motion". Getty Images. Retrieved 2017-09-14. ^ Daly, Ann (2002). Done into dance : Isadora Duncan in America (Wesleyan ed.). Middletown, Conn.: Wesleyan University Press. ISBN 0819565601. OCLC 726747550. ^ Greg Daugherty (2 May 2013). "8 Famous People Who Missed the Lusitania". Smithsonian Magazine. ^ Aaron Greer (7 March 2016). "Varshavianka (1924)" – via YouTube. ^ Stewart J, Sacred Woman, Sacred Dance, 2000. p. 122. ^ Mazo, Joseph H. Prime Movers: The Makers of Modern Dance in America. New York: Morrow, 1977. Print. ^ Turner, Erin H. (1999). More Than Petticoats: Remarkable California Women. Globe Pequot. p. 79. ISBN 1-56044-859-8. ^ "Duse, Eleanora (1859–1924)". glbtq: An Encyclopedia of Gay, Lesbian, Bisexual, Transgender, and Queer Culture. 2006-09-10. Archived from the original on 2007-07-23. Retrieved 2007-07-02. ^ "Isadora Duncan and Paris Singer". Dark Lane Creative. 2013-07-03. Retrieved 2018-04-17. ^ Gerrie (2014-09-24). "The Linosaurus: Isadora Duncan: a taste for life". The Linosaurus. Retrieved 2018-04-17. ^ S.A. Yesenin. Life and Work Chronology Archived 2016-09-18 at the Wayback Machine. The Complete Works by S.A. Yesenin in 7 Volumes. Nauka Publishers, 2002 // Хронологическая канва жизни и творчества. Есенин С. А. Полное собрание сочинений: В 7 т. - М.: Наука; Голос, 1995-2002. ^ Hugo Vickers, Loving Garbo: The Story of Greta Garbo, Cecil Beaton, and Mercedes de Acosta, Random House, 1994. ^ "DEATH By Flowing Scarf – Isadora Duncan, USA". True Stories of Strange Deaths. Archived from the original on 6 May 2016. Retrieved 18 May 2016. ^ "Isadora Duncan Meets Fate". Los Angeles Times. Associated Press. Retrieved 18 May 2016. ^ "Isadora Duncan killed in Paris under wheels of car she was buying". Sandusky Star Journal. September 15, 1927. Retrieved 18 May 2016. ^ "Affectations Can Be Dangerous". Three Hundred Words. Archived from the original on 2013-10-10. ^ Petrucelli, Alan (2009). Morbid Curiosity: The Disturbing Demises of the Famous and Infamous. ^ Kavanagh, Nicola (May 2008). "Decline and Fall". Wound Magazine. London (3): 113. ISSN 1755-800X. ^ "Search Results: "Maria Theresa Duncan" - Prints & Photographs Online Catalog (Library of Congress)". www.loc.gov. ^ "Search Results: "Anna Duncan" - Prints & Photographs Online Catalog (Library of Congress)". www.loc.gov. ^ "Search Results: "Irma Duncan" - Prints & Photographs Online Catalog (Library of Congress)". www.loc.gov. ^ Kateřina Boková. "100-year birth anniversary of Jarmila Jeřábková – dancer, choreographer and teacher". Czech Dance Info. Retrieved 5 March 2014. ^ "Search Results: "Lisa Duncan" - Prints & Photographs Online Catalog (Library of Congress)". www.loc.gov. ^ Jennifer Dunning (September 9, 2006). "Julia Levien, 94, Authority on the Dances of Isadora Duncan, Dies". The New York Times. ^ Kisselgoff, Anna (September 24, 1999). "Mignon Garland Dies at 91; Disciple of Isadora Duncan". The New York Times. Retrieved 18 May 2016. ^ "Journal of proceedings, Board of Supervisors, City and County of San Francisco". The Wayback Machine. Board of Supervisors, City and County of San Francisco. January 25, 1988. p. 89. Retrieved 19 May 2016. ^ Gowens PA, Davenport RJ, Kerr J, Sanderson RJ, Marsden AK (July 2003). "Survival from accidental strangulation from a scarf resulting in laryngeal rupture and carotid artery stenosis: the "Isadora Duncan syndrome". A case report and review of literature". Emerg Med J. 20 (4): 391–3. doi:10.1136/emj.20.4.391. PMC 1726156. PMID 12835372. ^ Tobias Churton (1 January 2012). Aleister Crowley: The Biography: Spiritual Revolutionary, Romantic Explorer, Occult Master – and Spy. Watkins Media Limited. p. 135. ISBN 978-1-78028-134-6. ^ Upton Sinclair (1 January 2001). Between Two Worlds I. Simon Publications LLC. p. 172. ISBN 978-1-931313-02-5. ^ "A Dancer is Unstrung By Grief in 'Isadora'". NPR. ^ "A Series Of Unfortunate Literary Allusions". NPR. ^ a b Ann Daly (1 March 2010). Done into Dance: Isadora Duncan in America. Wesleyan University Press. p. 221. ISBN 978-0-8195-7096-3. ^ John Cline; Robert G. Weiner (17 July 2010). From the Arthouse to the Grindhouse: Highbrow and Lowbrow Transgression in Cinema's First Century. Scarecrow Press. p. 241. ISBN 978-0-8108-7655-2. ^ Annette Lust (2012). Bringing the Body to the Stage and Screen: Expressive Movement for Performers. Scarecrow Press. p. 314. ISBN 978-0-8108-8212-6. ^ Kavanagh J. Secret Muses: The Life of Frederick Ashton. Faber & Faber Ltd, London, 1996, p543. ^ Carrie J. Preston (2011-08-08). Modernisms Mythic Pose: Gender, Genre, Solo Performance. Oxford University Press. pp. 293–294. ISBN 978-0-19-987744-7. ^ Keslassy, Elsa (September 24, 2015). "Lily-Rose Depp to Star as Isadora Duncan in 'The Dancer'". Variety. Retrieved December 29, 2015. ^ Angel G. Quintero Rivera (1989). Music, Social Classes, and the National Question of Puerto Rico. Woodrow Wilson International Center for Scholars. p. 34. ^ Peter Buckley (2003). The Rough Guide to Rock. Rough Guides. p. 195. ISBN 978-1-84353-105-0. ^ Dr Tracy Brain (22 July 2014). The Other Sylvia Plath. Routledge. pp. 1–. ISBN 978-1-317-88160-5. About Duncan's adopted daughter; Pamela De Fina, student and protegée of Maria Theresa Duncan from 1979 to 1987 in New York City, received original choreography, which is held at the New York Library for the Performing Arts at Lincoln Center. Savinio, Alberto. 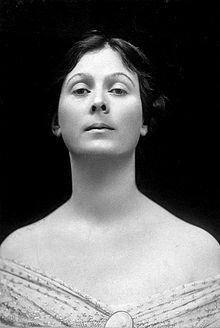 Isadora Duncan, in Narrate, uomini, la vostra storia. Bompiani,1942, Adelphi, 1984. Schanke, Robert That Furious Lesbian: The Story of Mercedes de Acosta. Carbondale, Ill: Southern Illinois Press, 2003. Stokes, Sewell. Isadora, an Intimate Portrait. New York: Brentanno's Ltd, 1928. Daly, Ann. Done into Dance: Isadora Duncan in America. Bloomington: Indiana University Press, 1995. "Atlas F1 historical research forum about the Amilcar debate". 2002-07-21. Archived from the original on 2016-03-03. Retrieved 2007-07-02. 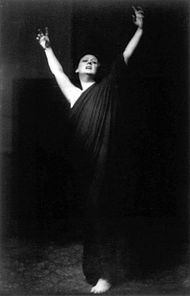 Wikimedia Commons has media related to Isadora Duncan. The Isadora Duncan pandect – Everything on the greatest dancer of the 20th century. Dora Stratou Dance Theater, Athens, Greece. The Isadora Duncan Archive- a repository of historical and scholarly reference materials; artistic and archival collections; repertory lists with music; and videos of Duncan choreography. Created by Duncan practitioners, the IDA envisions many dancers, researchers, scholars, students and artists will greatly benefit from this continually expanding and non-commercial resource. Finding Aid for the Howard Holtzman Collection on Isadora Duncan ca. 1878–1990 (Collection 1729) UCLA Library Special Collections, Los Angeles, California. Digitized manuscripts from the Howard Holtzman Collection on Isadora Duncan, ca 1878–1990 (Collection 1729) hosted by the UCLA Digital Library. Guide to the Isadora Duncan Dance Programs and Ephemera. Special Collections and Archives, The UC Irvine Libraries, Irvine, California. Guide to the Mary Desti Collection on Isadora Duncan, 1901–1930. Special Collections and Archives, The UC Irvine Libraries, Irvine, California.